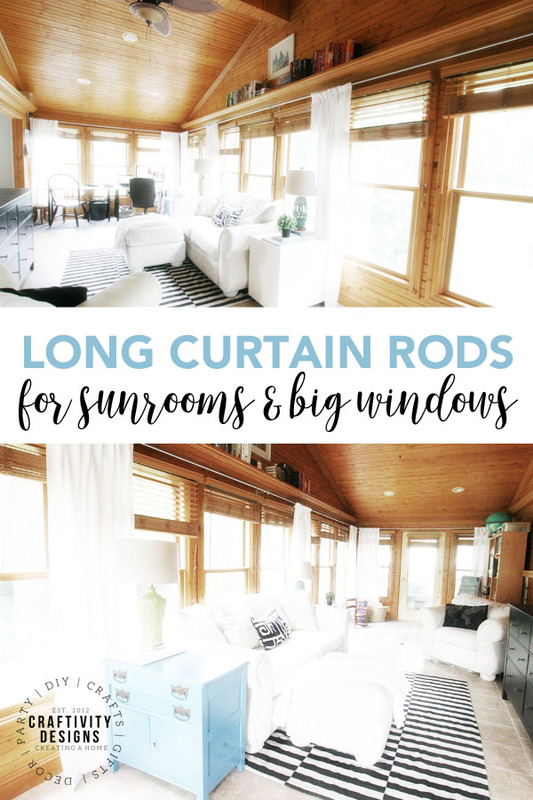 Are you struggling to find a long curtain rod for large windows or a sunroom? 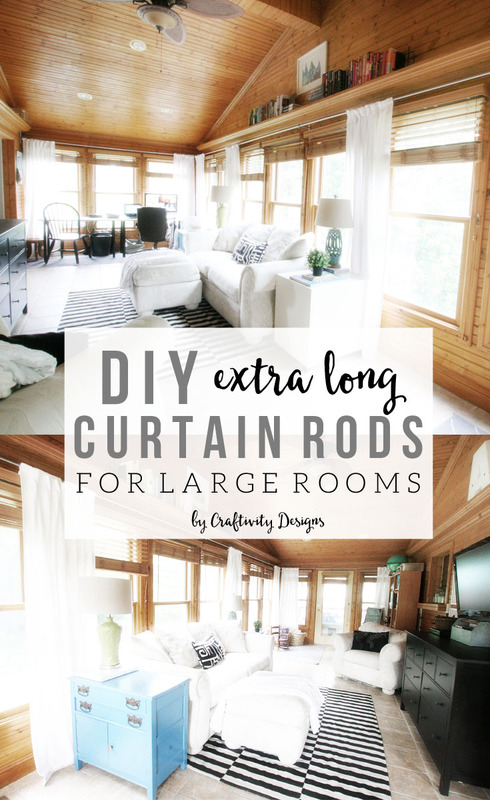 Extra long curtain rods can come at a pretty penny, but this DIY long curtain rod is a simple, affordable, and stylish solution. When we are house-hunting, a home full of windows and natural light is at the top of my must-have list. Therefore, it was the sunroom which sold us on our home. It’s a large, long room, with vaulted ceilings, and tons of windows. However, there is one downside to plenty of windows… purchasing window treatments. Window treatments don’t come cheap; and this sunroom requires 14 sets of blinds, curtains, and extra long curtain rods. Thankfully, the wood blinds came with the home (otherwise, that would have been a big investment — 14 sets of wood blinds, $$$! ); but the space still needed to be softened with curtains. Everything in the room had straight lines or a hard texture, except for the couch and chair. It wasn’t difficult to choose the curtains. Basic, white, curtains are my go-to window treatment. 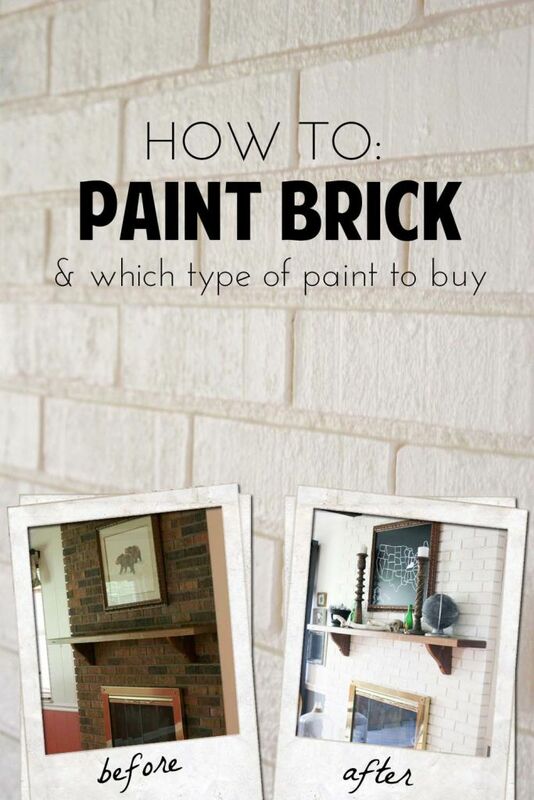 They offer a casual, breezy look, which is perfect for a sunroom. White curtains frame the windows, drawing the eye out the window toward the scenic view. 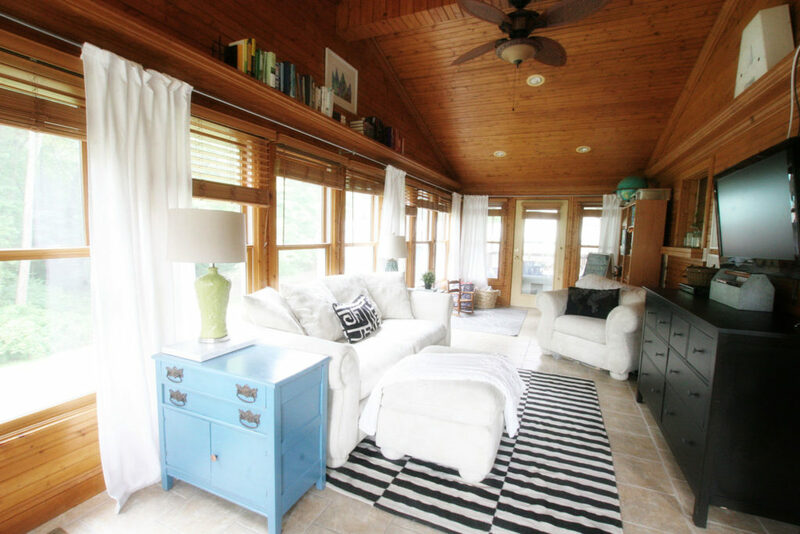 Sunrooms aren’t are a room that needs curtains to become a focal point. You’ll notice that we didn’t flank every window with curtains. Privacy isn’t an issue since we already have blinds. I used 8 curtains for 14 windows. On each end of the room, there is a set of three windows flanked by two curtains. 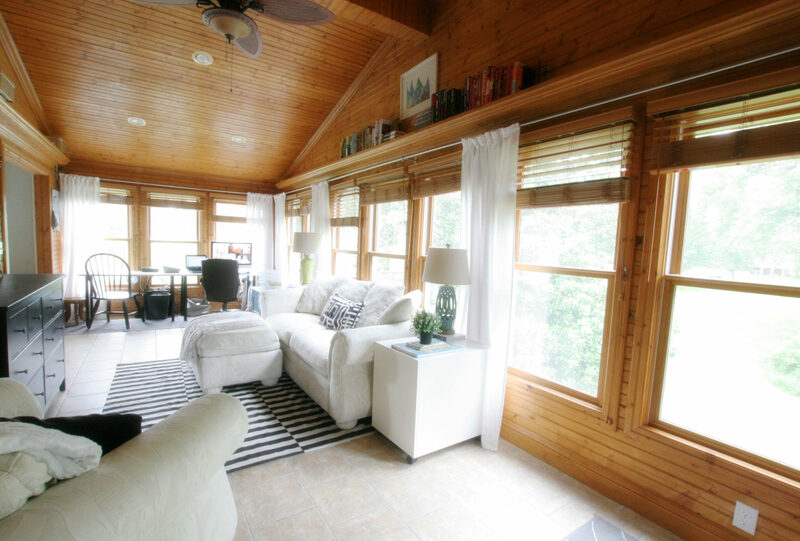 Across the length of the sunroom, there are 4 curtains for 8 windows. I chose where to hang curtains based on how it looked with the furniture. For example, a curtain on each side of our couch — which equaled 3 windows. So, how did I hang all those curtains? An assortment of electrical conduit, fasteners, and plumbing hardware. 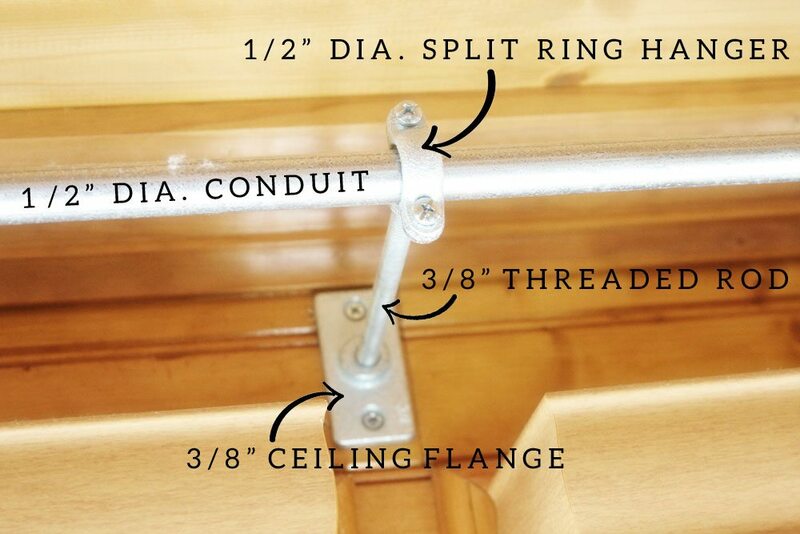 You can search “pipe curtain rods” or “DIY curtain rods” on Pinterest and find a variety of tutorials. This Custom Long Drapery Rod tutorial from Sarah M. Dorsey Designs was one of the most helpful. We didn’t follow that tutorial exactly, but it was a good reference. Sarah M. Dorsey chose to spray paint her curtain rods black, which really compliments that room and definitely makes this a very versatile project. Essentially, you can easily coordinate the long curtain rods with any existing hardware… all you need is a can of spray paint! In our Sunroom, we didn’t want to draw the eye up or create much contrast. 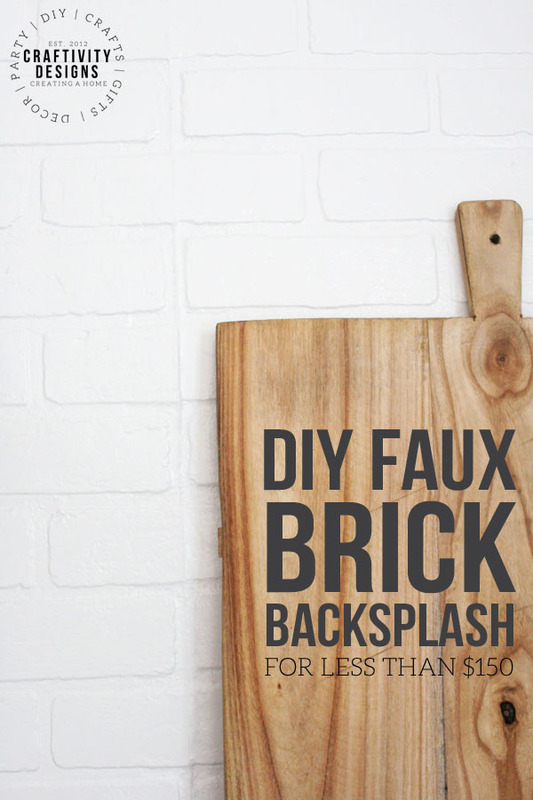 So, in our case, the galvanized steel was great as-is (yay for simplicity!) and just required a little Goo-Gone to remove sticker labels from the conduit. 1. 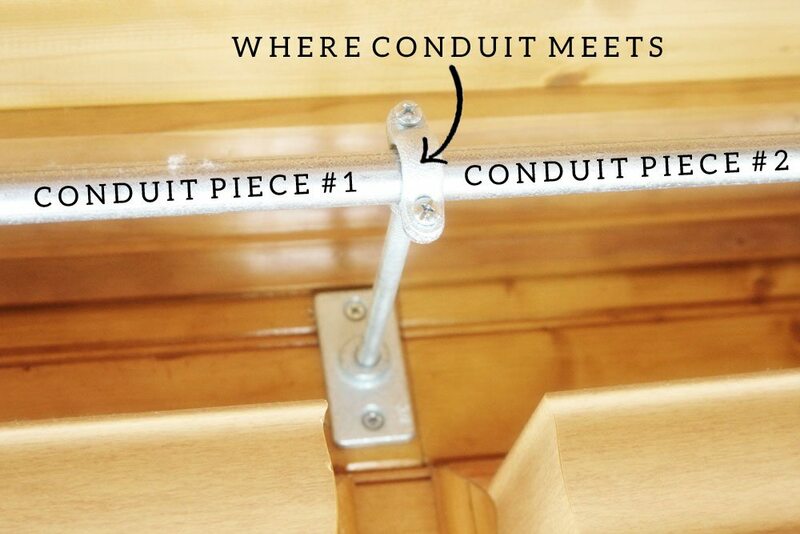 First, determine how many pieces of conduit you will need, and where they will be located. We used a single piece of conduit for each end of the room and several pieces across the longest wall. Take time to measure and determine where the braces will be located, so that you can cut the conduit to meet at a brace. 2. Next, determine where each mounting brace will be located. 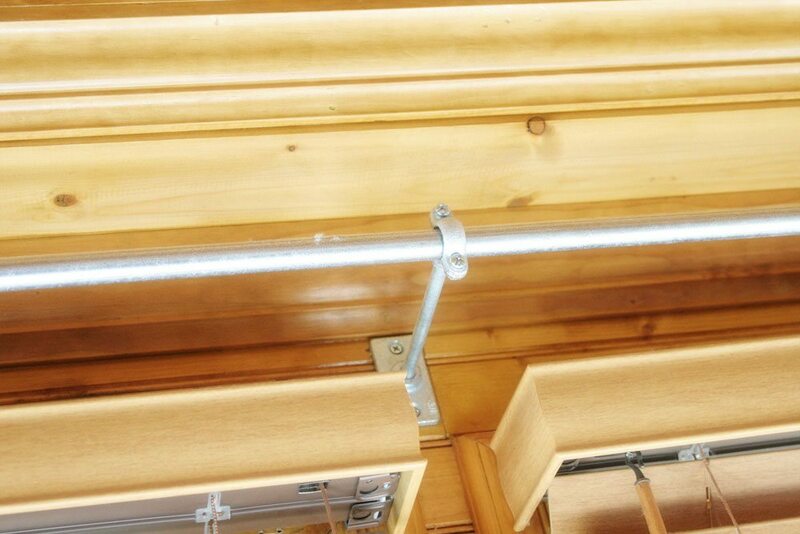 We placed each brace between window frames to give the long curtain rods a consistent look. 3. Once everything is measured, cut the conduit. Cutting the conduit was amazingly simple with a Rigid Tubing Cutter! I had never used one before, but it was straightforward, quick and easy. The threaded rod, on the other hand, was not so simple. 4. Cut the threaded rod to size. 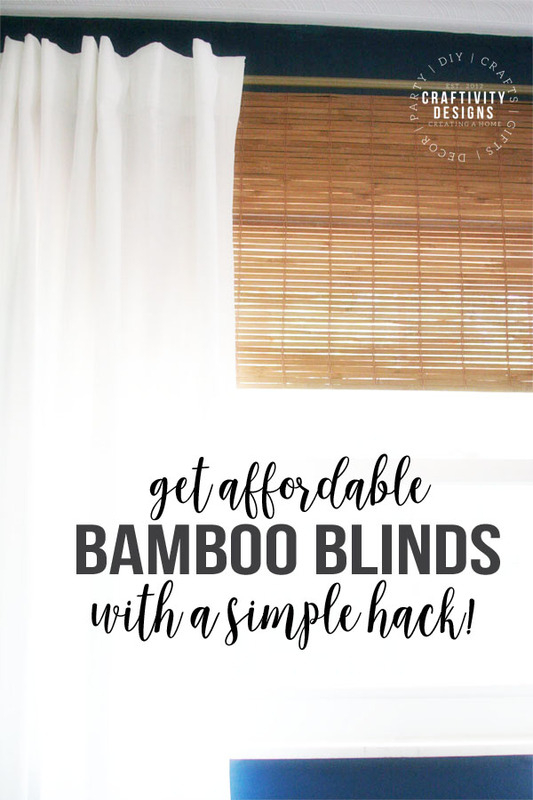 We needed about 5″ of threaded rod per mounting brace in order to hang the curtain rod far enough out that it would clear the wood blinds. My husband ended up requesting the help of a friend to saw the rod into 5″ pieces because we didn’t have an angle grinder with a metal cutting wheel. 5. Once everything is cut to size, assemble each mounting brace and attach it to the wall. 6. Finally, remove the fronts of the split ring hangers to add the conduit. Once the conduit is in place, reattach the fronts of the split ring hangers (this will be easiest with two people and an extra set of hands). Installing DIY long curtain rods really transformed our sunroom. Hanging curtains softened the space and made it feel finished. Plus, the total price was less than $75 for nearly 50 ft of curtain rod! What an incredible price, right? Even inexpensive 10 ft curtain rods are $35 and up, which would have meant that we’d be spending at least $175. 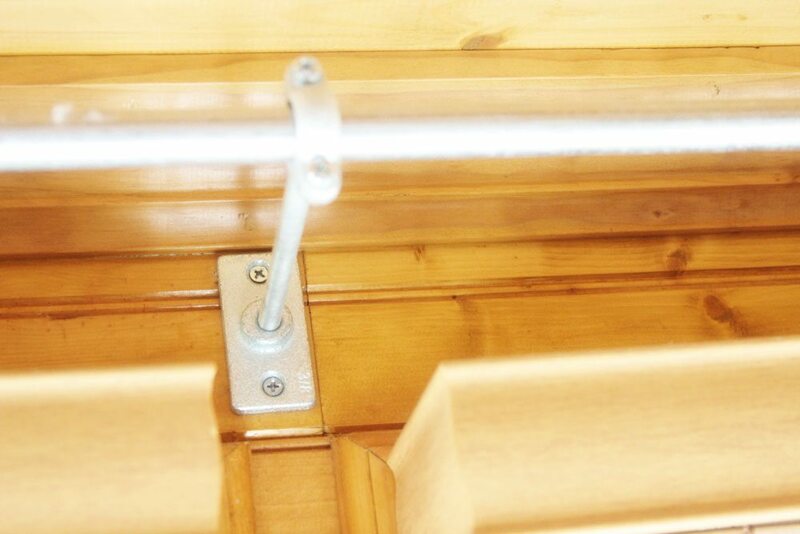 Plus, that is assuming we would have been able to find curtain rods that cleared the depth of the wood blinds. We are incredibly pleased with a custom look for a fraction of the price. Like this post? Save it for later and pin it! Wow, Lora! I have never thought of making a curtain rod. Such a great idea for large window space. Your home has so many windows and I love everything about the space and your description of your home. I am with you on the white curtains. At this new place, one of the things I am loving too is the amount of windows. Our old home had practically none (well only a couple). I always felt so closed in. But my plan is to use white curtains throughout except maybe in the kids rooms. I envy that sunroom for sure!! I really love how you made it cozy yet so breezy!! Beautiful view! That room looks amazing, such a big space full of light. I love white curtains! they dress up the walls so nice. lovely project idea, it wouldn’t cross my mind to join the rods like that! They look great and I personally favor the galvanized look. You can’t beat the savings either! 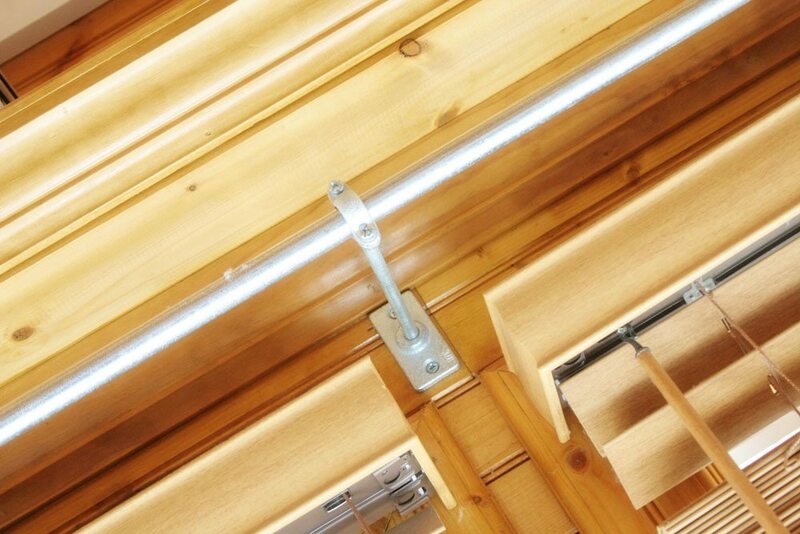 Using light weight white curtains allows for light and balances well with the heavier – visually – wooden blinds. Yes, so true, great point! I used a whittled down wine cork to keep my two pieces of conduit aligned. That is brilliant! So smart!